A major part of Black to Green has been the Interpretation and Orientation project which has seen seven bespoke interpretation hubs installed at points along the Heart of Forest Trail network. 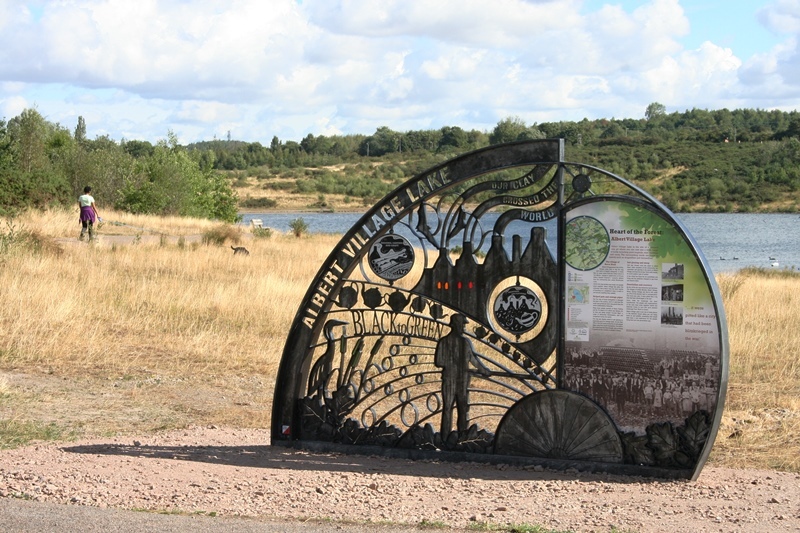 The trail is split into two circuits – the Northern Circuit which is 7.25km/4.5 miles and takes in Furnace Plantation, Moira Junction South, Albert Village Lake and Bath Yard Basin and then the Southern Circuit – 8km/5.5 miles long, covering Hicks Lodge, Thortit Pit and Donisthorpe Colliery. Or you can make a day of it and experience them all in one go. In addition to the hubs, 28 new fingerposts and 75 new flags now help users better navigate the trail and a Heart of Forest Trail Leaflet is available in print & below to download. The interpretation hubs have been designed by Differentia in partnership with many residents and volunteers within the Heart of the Forest and provide an opportunity to share the remarkable stories of this transformed area. The hubs have been inspired by stories of communities who lived and worked in the villages in and around the Ashby Woulds, between Swadlincote, Ahby-de-la-Zouch, Measham and Overseal. Pick up your copy or download the version below and get exploring the wonderful industrial and natural heritage that we have across the Heart.